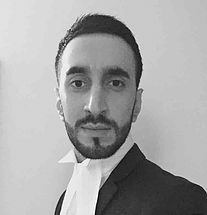 Ahmed practises all areas of Criminal Law and is regularly instructed by defence solicitors and the CPS undertaking both defence and prosecution work. Ahmed regularly appears in the Youth, Magistrates and Crown Courts in and around London and has exposure to a varied case load within crime. Ahmed has a busy practice regularly working on matters ranging dishonesty offences, possession and supply of drugs, violent offences, sexual offences and driving offences. Professional and lay clients have often credited Ahmed’s fearless advocacy and ability to quickly identify legal issues. Lay clients have commended his ability to build rapport with them and his emotional intelligence when dealing with their case. Ahmed has a vast experience in motoring law having prosecuted and defended a wide variety of traffic offences. Ahmed has presented technical defences to offences of speeding, no insurance, drink and drug driving, failure to provide, as well as successfully defending several cases of driving without due care and attention. Ahmed also has particular expertise in mitigation allowing clients to have the minimum number of points imposed or keep their licence, such as one client keeping his licence despite travelling over 110mph on a motorway. Ahmed is regularly instructed in cases to which involve advancing special reasons or exceptional hardship, in one circumstance allowing a client with 15 points to keep their licence. Ahmed has particular aptitude for conducting sensitive Domestic Violence cases with vulnerable victims given his experience both prosecuting and defending such cases within the Criminal Courts. Ahmed is experienced in applying for and opposing non-molestation orders whilst understanding his client’s needs and the best route to achieving them in sensitive situations. Successful defence despite the defendant being found in possession of over £500 worth of crack cocaine, cash and two mobile phones. The jury found the Defendant not guilty in under an hour. The defendant accepted entering a dwelling via a second floor window, however stated he did so in order to escape a drug deal which went wrong in a neighbouring house. Following a 3 day trial the jury returned a not guilty verdict in 15 minutes. The defendant was identified by the victim and various pieces of phone evidence linked the defendant to the scene of the crime, who maintained he was at home. Successfully opposed the Crown’s application to adduce previous convictions of robbery and bladed article offences. Despite what was described as “overwhelming evidence”, the jury took 3 and half hours to convict. R v E – Aylesbury Crown Court – Possession with intent to supply Class B & Possession of disguised firearm The firearms offence carried a minimum sentence of 5 years imprisonment. Despite strong expert evidence for the Crown representations were made before the day of trial and the charge was reduced to one of possession of a prohibited weapon, avoiding the minimum 5 year sentence. At sentencing the defendant received 52 weeks custody. Succesful defence of S18 GBH trial where the Defendant was accused of stabbing his flatmate with a kitchen knife. Acted for C who faced a charge of affray involving several weapons along with 2 other Defendants. The 2 other Defendants were both blaming C as the aggressor and maintained they were victims. Following a 12 day trial C was successfully acquitted and both other Defendants were convicted. Successful defence against criminal damage and possession of offensive weapon. Following a 3 day trial the jury acquitted the Defendant in 3 minutes. Represented a client who pleaded guilty to 2 counts of possession with intent to supply Class A drugs. The starting point was 4 years 6 months imprisonment. Following mitigation and representation the client received a 2 year suspended sentence. Domestic ABH charge where the Defendant ran self-defence. Despite the guilty verdict the Presiding Judge His Honour Judge Carey invited me in to chambers following the trial and commended me on the way I presented the defence and that his honour thought I was much more senior than my call. R v K – Croydon Crown Court – Possession of an Offensive Weapon & Possession of Bladed Article Defendant on trial for a total of 10 counts of possession of bladed articles and offensive weapons. Following representations made on the day of trial the offensive weapon charges were all dropped and several counts relating to bladed articles were dropped. The Defendant faced 2 charges instead of 10. Husband and wife both jointly charged following a motoring offence. They were a Doctor and Lawyer. Following strong representations and legal applications to exclude various evidence under s78 the charge was reduced to wasting police time. Successful defence of a Moroccan national charged with sexual assault on his wife. Successful defence of Tunisian national charges with assaulting his son. Despite the client’s wife, son and daughter in law all giving evidence against him, the client was acquitted. The trial involved several complexities as one of the witnesses was severely disabled and not able to easily communicate, therefore a careful and considered approach in questioning was required. Successful defence of two notorious internet pranksters of impersonating police officers. Internet pranksters charged with possession of an offensive weapon, following representations the charge was dropped. Successful defence of an man on trial for attacking his wife. The complainant had alleged she was attacked with a ladle causing a substantial cut across her face. Defendant was found not guilty. Large knife found in the Defendants bag at Nottinghill Carnival at a stop and search. Successfully excluded comments made at the scene due to PACE breaches. Defence of knowledge advanced and Defendant was found not guilty after trial. Successful defence of driving without due care and attention. Case was dismissed at half time following a cross-examination of the complainant and a successful no case to answer application. Defending 2 charges of criminal damage and 1 public order offence. Witnesses for the Crown were 3 police officers. Both criminal damage charges were dismissed at half time following a successful no case to answer application. Successful defence of theft by finding. Case was dismissed of court following a successful no case to answer application. Successful defence of burglary. Case was dismissed at half time after a submission of no case to answer. Successful defence of a charge of driving whilst unfit through drugs. Hip flask defence advanced. Successful defence of a man charged with handling stolen goods. Despite a bad character application from the Crown which adduced over 30 convictions for theft, following cross-examination and representations the Defendant was acquitted. Successful defence of Defendant charged with possession of an offensive weapon namely an axe in public. Successful prosecution of s18 GBH youth trial. The trial involved several youth witnesses and youth defendant. Successful defence of interfering with a motor vehicle following cross-examination of a police officer and highlighting PACE code breaches which ultimately excluded the evidence. A successful exceptional hardship was presented to the court allowing a client to keep his licence after accumulating 15 points. R v E – Defendant was charged with possession with intent to supply class B and possession of 3 disguised firearms. The firearms offence carried a minimum sentence of 5 years imprisonment. Despite strong expert evidence for the Crown represententations were made before the day of trial and the charge was reduced to one of possession of a prohibited weapon, avoiding the minimum 5 year sentence. R v C & Others – C faced a charge of affray involving several weapons along with 2 other Defendants. The 2 other Defendants were both blaming C as the aggressor and maintained they were victims. Following a 12 day trial C was successfully acquitted and both other Defendants were convicted. R v I – Successful defence against criminal damage and possession of offensive weapon. Following a 3 day trial the jury acquitted the Defendant in 3 minutes. R v Herr – Represented a client who pleaded guilty to 2 counts of possession with intent to supply Class A drugs. The starting point was 4 years 6 months imprisonment. Following mitigation and representation the client received a 2 year suspended sentence avoiding immediate custody. R v S – Successful defence of a Moroccan national charged with sexual assault on his wife. R v N – Successful defence of Tunisian national charges with assaulting his son. Despite the client’s wife, son and daughter in law all giving evidence against him, the client was acquitted and awarded his legal costs. The trial involved several complexities as one of the witnesses was severely disabled and not able to easily communicate, therefore a careful and considered approach in questioning was required. R v J – Successful defence of two notorious internet pranksters of impersonating police officers. R v J – Internet pranksters charged with possession of an offensive weapon, following representations the charge was dropped. R v A – Successful defence of an man on trial for attacking his wife. The complainant had alleged she was attacked with a ladle causing a substantial cut across her face. Following intricate cross examination the client was found not guilty. R v K – Defendant on trial for a total of 10 counts of possession of bladed articles and offensive weapons. Following representations made on the day of trial the offensive weapon charges were all dropped and several counts relating to bladed articles were dropped. The Defendant faced 2 charges instead of 10. R v A – Successful defence of driving without due care and attention. Case was dismissed at half time following a cross-examination of the complainant and a successful no case to answer application. R v G – Defending 2 charges of criminal damage and 1 public order offence. Witnesses for the Crown were 3 police officers. Both criminal damage charges were dismissed at half time following a successful no case to answer application. R v S – Successful application following a guilty plea to ask the court to accept a case of exceptional hardship. R v S – Successful defence of theft by finding. Case was dismissed of court following a successful no case to answer application. R v K – Successful defence of burglary. Case was dismissed at half time after a submission of no case to answer. R v O – Successful defence of a charge of driving whilst unfit through drugs. R v L – Successful defence of a man charged with handling stolen goods. Despite a bad character application from the Crown which adduced over 30 convictions for theft, following cross-examination and representations the Defendant was acquitted. R v L – Successful defence of defendant charged with possession of an offensive weapon namely an axe in public. R v G – A charge of perverting the course of justice was reduced to wasting police time following representations on the day of trial. R v O – Successful prosecution of s18 GBH youth trial.